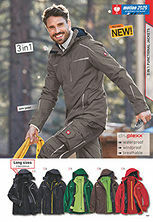 Sporty functional jacket in the e.s.vision style with waterproof, windproof and breathable features thanks to the dryplexx® membrane. 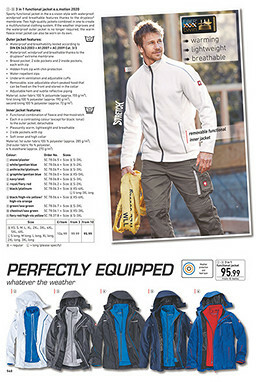 Two high-quality jackets combined in one to create a multifunctional clothing system. If the weather improves and the waterproof outer jacket is no longer required, the warm fleece inner jacket can also be worn on its own. Material: outer fabric 100 % polyamide (approx. 155 g/m²), 1. lining 100 % polyester (approx. 190 g/m²), 2. lining 100 % polyester (approx. 72 g/m²). Material: 1st outer fabric 100 % polyester (approx. 285 g/m²), 2nd outer fabric 96 % polyester, 4 % elasthane (approx. 270 g/m²).